I loved Barbie as a little girl. I remember my first one was a ballerina Barbie, complete with some sort of crown thing that was stuck in her head. My first Ken was a roller-skating ken, with roller skates, black shorts and jacket that had some sort of holographic print down the side. I always found it strange that a ballerina would date a roller-skater, but hey, I made it work. It was easier than Barbie dating my brother’s GI Joe’s, or the WWE (back then it was WWF) wrestlers. Both the aforementioned had height disadvantages and were too short for Barbie! Needless to say, I loved them. Fast forward twenty (or thirty) something years, and my little ones love Barbies too. They have a suitcase full of them. Ballerina princesses, ones featured in Barbie movies (like A Fashion Fairytale), Disney movies, including Tangled and Brave, and so on. There are multiple Ken dolls and little sisters thrown in the mix too. The latest additions to that growing pile are these mini-Barbies they gave out at the Golden Arches, which feature those from the movie Barbie in the Pink Shoes. And so, we have two of everyone (one for the Little Bird and one for the Little Mouse). 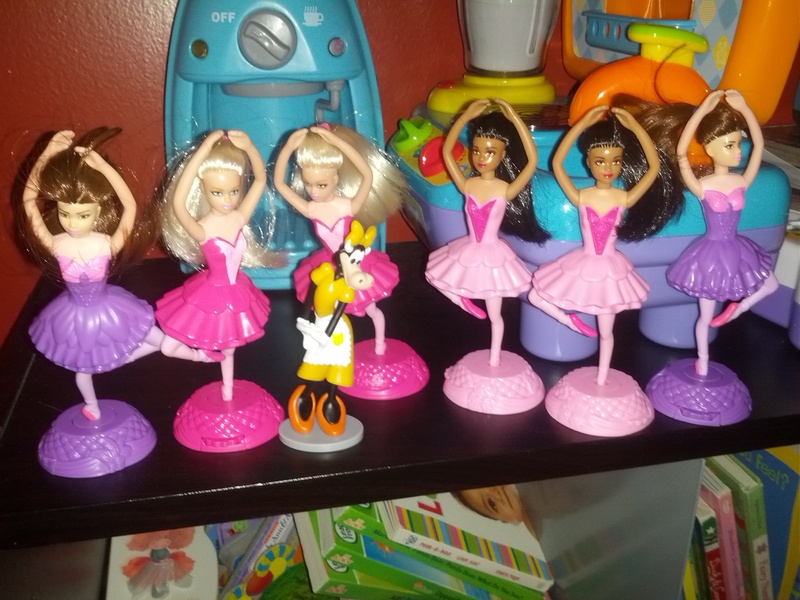 I found this line-up this morning…all six dancers, and Clarabelle Cow. I felt an instant twinge of pity for Clarabelle. No doubt my Little Mouse put her there…as the Little Bird often leaves Clarabelle behind. For those who are not lucky enough to watch Disney Junior on a regular basis, Clarabelle Cow was created in 1928 and she is best friends with Minnie Mouse and Daisy Duck. According to The Disney Wiki, Clarabelle Cow started dating Goofy in the late 1960’s. She’s a bit of a gossip and is a girl after my own heart, and likes to shop. She is an entrepreneur (owning The Moo Mart) and likes to throw a lot of parties. However, as awesome as she sounds, she’s not the most popular Disney character, and that’s obvious with my own kids. Minnie Mouse and Mickey Mouse, Daisy Duck and Goofy get top picks in our house. However, my little one seems to like her. I think she’s a great character, and not a conventional one at that. She’s taller than all the others, which I assume is why they paired her with Goofy. I think she portrays a healthy body image and doesn’t take herself too seriously. The cow is cool by my books. If you’ve seen a lot of the new shows on kid-friendly television stations, they’ve taken a lot of characters and given them a “slim-over”. Suddenly Strawberry Shortcake is a tall and very skinny redhead. I found they sort of stretched out Minnie and Daisy too. I don’t know why they do that. Kids don’t care. The Strawberry Shortcake dolls I played with as a kid were plump and short and cute. Now they have long, flowing hair, and are super slim. I get that some things need to change, but I don’t think kids characters should be one of them. Let the kids be kids, and not worry about the appearances. So if my little one wants to stick Clarabelle Cow in the middle of a Barbie dance recital, I say let her. Maybe the Barbie’s will see they need to eat a donut once in a while!